I’m a New Orleans enthusiast. 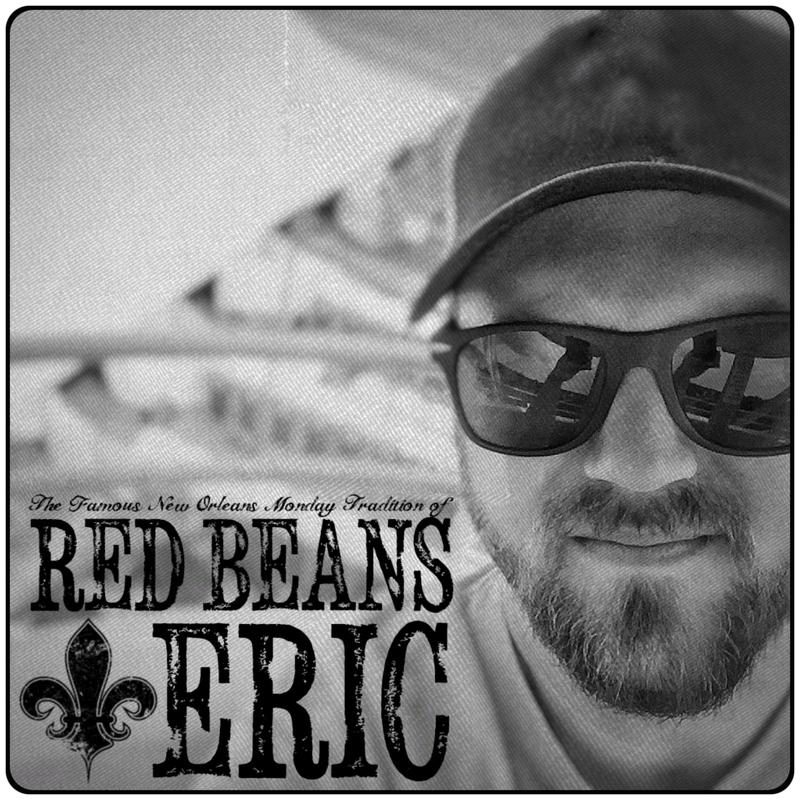 Red Beans & Eric is inspired by the food and culture of New Orleans. While most of the food recipes, news articles, and interviews are centered around New Orleans and the Creole and Cajun cooking methods (and red beans and rice, of course), you’ll find that what you read here is relevant to where ever it is you call home – not just to those in southern Louisiana. I don’t live in New Orleans or even Louisiana for that matter. I’m not even from that part of the country. I’m from just north of Detroit, Michigan. I’ll share with you how I’ve created a New Orleans kitchen in my Detroit home and help you find the resources and ingredients you need to get that amazing flavor of southern Louisiana. Of course, you need to be in NOLA to get that real flavor – however, your kitchen is the next best spot! I love to share classic recipes from New Orleans along with a lot of my own creations, inspired by Creole and Cajun ingredients, methods, and techniques. I talk a lot about red beans and rice, but this website is more than that, it’s also about community, culture, and coming together over amazing food. Thank you for stopping by and be sure to find me on your favorite social media site! If you make one of my recipes, please hashtag it with #RedBeansAndEric or tag me on it @RedBeansAndEric. I’d love to see it and share it with everyone else here in our community. You can always email me at RedBeansAndEric@gmail.com, or by visiting the Contact Us page and leaving a message. I’m always up for a discussion on red beans and rice! P.S. If you want to learn more about me and the origin story of Red Beans & Eric, be sure to read the It’s a Long Story page. Red Beans & Eric at Fluerty Girl in New Orleans. It’s total comfort food. Having red beans and rice is something that was way different from what I grew up on in the Midwest, but once I started making it, smelling it as it cooked, and eating it, it just became something I craved. I chose “Red Beans and Eric” because, in my name, you can spell “rice”. In the beginning, I couldn’t make a pot of decent RB&R for anything. But as I was determined to master the Monday meal, I learned how important it is to the culture of New Orleans and not to add salt at the beginning of cooking. But seriously, how many meals out there can you name that is cooked by practically everyone in a region, on the same day, and it’s not a holiday? Red beans and rice is that quiet meal in the background of New Orleans. Everyone knows it’s there but it’s not the one everyone rushes to. Everyone wants the gumbo, po’boy, jambalaya, Shrimp Creole, Oyster Rockefeller. And that’s something I can relate to. If you’re not a chef, how did you learn to cook? I moved away from my mom. My wife moved away from her mom. We needed to eat. In my late teens, I was a short order cook for a couple of years so I knew very little. However, it was a little more than my wife knew. Needless to say, we ate out a lot. But when my first son was born, I wanted him to grow up eating meals prepared by either me or my wife – not relying on fast food. To do this, since I liked cooking basic meals and my wife didn’t, I learned to broaden my cooking horizon past hot dogs with mac ‘n’ cheese. I had some basic cookbooks and just started cooking. The more I did it, the more I liked it. How do you come up with all these recipes? I first learned Creole and Cajun cooking by making the recipes in cookbooks exactly as written. By doing this I learned what each recipe needs to have, what is interchangeable, and what can still be added. Once you know the rules, you can adapt and change them without totally breaking them. And in some recipes, I broke the rules, ordered a pizza, then started discovering what different ingredients can do together. Many times I’ll take one dish. Find two or more recipes on it, and start mashing it all into one recipe. It’s fun. I don’t live in Louisiana. How do I get the same flavors? Do you want to know how I red bean? Are you looking to hire an editor, a proofreader, or a new writer? I’m not. It’s only me. I like to compare my writing style to New Orleans – it’s not perfect. I just hope I don’t have as many writing mistakes as New Orleans has potholes. If you do find something, and it’s bothering you, please send me an email and I can correct it.